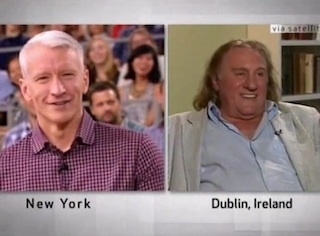 On his new talk show today, Anderson Cooper called his now-infamous giggling clip, in which he can’t stop laughing while reporting on Gerard Depardieu’s peeing on a plane scandal, maybe the most embarrassing moment of his life. It was certainly one of our favorite clips of the summer. However, today’s segment in which he interviewed the actor about the incident might just top it. At the very least, it’s one of the more surreal things you’ll see today. Seriously, there’s just so much weird stuff going on here. There’s Depardieu candidly explaining that the water bottle he used wasn’t enough to contain his urine since he’s “an elephant.” There’s the Anderson studio audience all holding up there own water bottles in solidarity. There’s Cooper and Depardieu connecting over the fact that not being able to stop giggling and not being able to hold in your pee are fairly similar.